The New Abbe Refractometer Model R8 is a compact& handy measuring instrument. The measuring Prism is rigid and the surface to take the substances to be measured is horizontal which prevents flowing down of the test liquid of the prism is one of the new features which no other indigenous make Abbe Refractometers provides. The Prism box is made of Stainless Steel and as such highly corrosive material can be tested without damaging the Prism Box. Focussing of the boundary line of total reflection is effected on the same field of view in which the reading is taken. Setting and Reading operation in the same-Eye-Piece makes the work of the operator easy and efficient. The graduated Arc Scale made of glass lies well protected inside of the instrument with all other Optics. The compact design of the basic equipment facilitated the construction of a casing which, while permitting full utilisation of its optical properties, afforded reliable and robust protection of all delicate parts against potential mechanical, thermal of chemical damage. 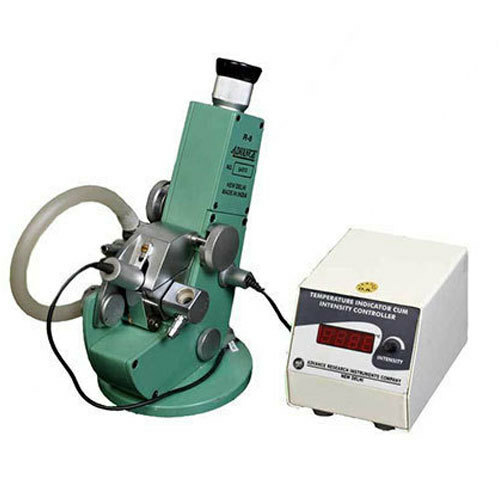 In order to maintain a constant temperature for more accurate measurements, the Prism mounts on the Refractometer are equipped for circulation of fluid at constant temperature when connected to a Thermostatically Controlled Circulating bath. Completely sealed optics for operation in tropical regions and extreme operating conditions. Dual graduations of Refractive Index & Brix. Measurement of Dispersion of liquids with conversion table. Horizontal Prism to prevent flowing down of test liquid and for customer convenience. Water Jacketed Prism Box which can be connected to Circulating Thermostat for Temperature Maintenance. Compensator to compensate for Dispersion in the Medium under test.